He calls himself "Sixpack", but the 23-year-old German top athlete Alon Gabbay has got far more than only amazing abs. 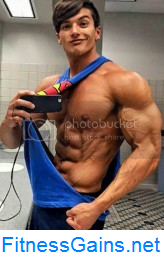 His many fans admire his muscle gains, his definition, his proportions, and the passionate bodybuilder's knowledge. 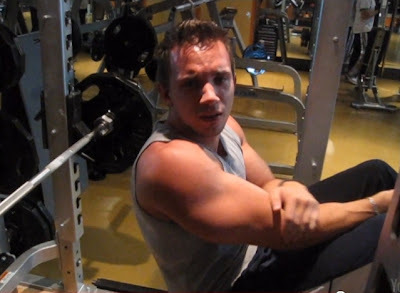 Alon documents his progress in this video: from 136 lbs to 187 lbs. His arms show the effect. 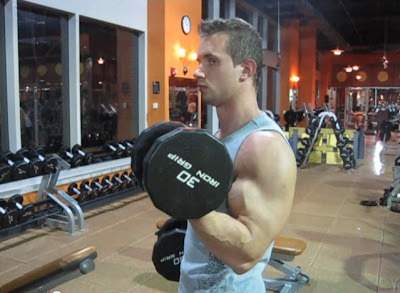 Kamil Bak, the 25-year-old fitness model living in Philadelphia, Pennsylvania, US (height: 5'11", weight: 159 lbs), hits the iron in two videos. 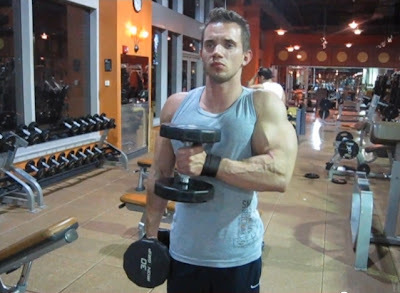 In the first video he does standing biceps curls and hammer curls, in the second video Kamil demonstrates negatives at the bench press. The Members Section contains 92 videos, and is updated weekly. Bodybuilder and wrestler Jessie Godderz demonstrates in this video his leg workout: squats and several sets at the leg press. Tarzan poses: The site CzechYoungMuscle has published new fantastic galleries of its extremely popular model Filip Jurka. You find all of Filip's high quality photos and videos here on CzechYoungMuscle. A new top athlete on AllAmericanGuys: William is originally from Nebraska, but moved to Florida in his early teens. He's an avid sportsman and played NCAA division I football in college. He also loves baseball, MMA, kickboxing, Brazilian jujitsu, weightlifting and mountain biking among other sports. When not working as a part time model or engineer (his day job), his hobbies include hunting, fishing, going to concerts, beach trips, strip clubs and casinos. He's also a personal trainer on occasions as he likes to pass on his knowledge of fitness and body sculpting. You find many high quality photos and videos with William here on AllAmericanGuys. "When determining the amount of reps to do you must first determine what your goals are. Low reps (1-8) produce the greatest amount of absolute strength. Medium reps (9-20) produce more anaerobic strength. While high reps (21-40) produce mainly aerobic endurance strength. As a bodybuilder variety is the key for muscle growth, so you will want to train in a wide rep range. This range can go anywhere from 1-40 reps with 90% of your training between 5-15 reps. When lifting heavy, around 8 reps or less, you will be using your white muscle fibers more. As you get into the higher reps, around 15 or more, you will be using the red fibers more. While 10-12 reps produces the most volume. Knowing when and how to change these reps is a major part of making results. Think of every rep as a set and every set as a series'. Don't rush through the reps so you can get to the last one. Instead focus on every rep as if it were an entire set. Focus on proper movement and form, focus on feeling the muscles work, and focus on getting the most out of that rep. Then put that same focus into the next one. This will allow you to get maximum results from every workout." The guns and pecs of a 20-year-old bodybuilder: Watch the German competitor Sebastian Hotz training his massive arms and chest, 10 weeks before his next competition.